Volunteers, participants and spectators all gathered on the boardwalk for the 2016 Hair of the Dog 5K run/walk and 10K run. For an eighth straight year, local residents will be able to ring in the New Year with the Annual Hair of the Dog 5K run/walk and 10K run, which are being held in conjunction with the 23rd edition of the Leo Brady Exercise Like the Eskimos plunge into the Atlantic Ocean. Organized again by the Quiet Resorts Charitable Foundation (QRCF), the downtown Bethany Beach-based events will get under way on Tuesday, Jan. 1. The races will kick off at Parkwood Street and Atlantic Avenue before ending at the Bethany Beach bandstand. The 10K starts at 8:45 a.m., while the 5K starts at 10:45 a.m., with the plunge following at noon. There are awards for the runners that include first place overall for both the males and females, and Top 3 awards overall for owner and dog (which are permitted in the 5K event only and must be leashed, on a non-recoil leash, at all times), as well as other division and age-based awards. As for the plunge, there are also awards for that event. The “A Whale of a Team” award will be presented to the largest registered team for the event, and the “Bathing Beauties” award will go to the team with the best attire or theme. Judging will take place for the latter on the beach from 11:30 to 11:50 a.m. The “Leo Brady Award” goes to the team with the most donations raised for the William O’Murray Scholarship. All teams must have a minimum of six registrants to qualify for any of the awards. While proceeds from the event itself go to the QRCF — an organization formed in 2001 by the Bethany-Fenwick Area Chamber of Commerce that “manages and distributes funds to qualified organizations serving our local community,” tax-deductible donations raised by participants will go to support the Captain William O’Murray Scholarship. Online registration for the event closes on Friday, Dec. 28. 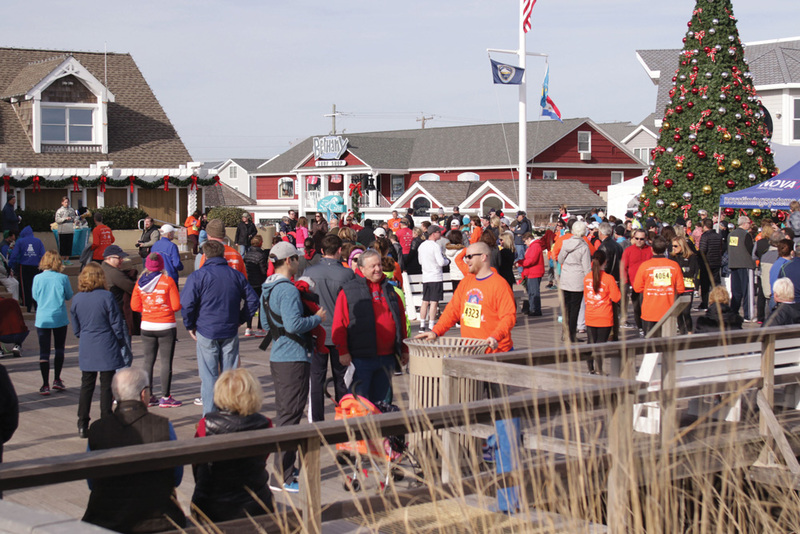 Onsite registration and advance packet pick-up will be from noon to 3 p.m. at Mango’s on the Bethany Beach boardwalk on Monday, Dec. 31. Race-day packet pickup will be from 7:30 to 8:30 a.m. in the event tent on the bandstand, while plunge packet pickup will run until 11:30 a.m.
A post-race party will take place at Mango’s from 9:30 to 11 a.m., with a free Shock Top or Michelob Ultra provided to age-appropriate runners by NKS Distributors, as well as fruit, muffins and yogurt for participants and paid guests. (A limited quantity of party wristbands for family and friends will be available for purchase at packet pick-up, at $10 each. Children younger than 5 do not need a wristband.) The party also features chili provided by local restaurants. A post-plunge party will take place from 12:30 to 4 p.m. at the Cottage Café, where the plunge awards will be presented. Fees range from $20 for the plunge only, to $70 to participate in the plunge and both races. Hair of the Dog hoodies will be available for purchase, for $30, with additional event shirts available for $10 each. For more information on the event, or to register online, visit www.qrfc.org or call the QRCF at (302) 537-7723.